The very first indication of unwelcome rodent visitors in your home may well be the discovery of some of their uninviting little ‘business cards’ – yes, we are talking about droppings, feces or just plain mouse poop! One day you open a corner cupboard and there it is – a telltale line of small brown jobs… Or you go into your garage and notice the same unmistakable tiny pellets. It’s definitely time to investigate, know what you are up against and then take some appropriate action. This article will give you the facts about mouse droppings as we walk you through the process of identifying the type of rodent responsible, ascertaining the extent of the infestation and learning some safety tips for cleaning up the mess. Before you do anything else, you need to set some traps. The only way to know for sure if you’ve got mice problems is to catch them. If you’re here, then I’m assuming it’s the your first time discovering what you think are mice droppings. Don’t forget the number rule when using traps to deal with mice. The rule is, the first time you use them, is really important to go all out and set up as many of them as you can. I recommend buying a case of sticky traps and lots of the snap traps. For the very best results, set up as many as you can the first night. After the first few nights, they start learning that the traps are deadly, so they become a little less effective. 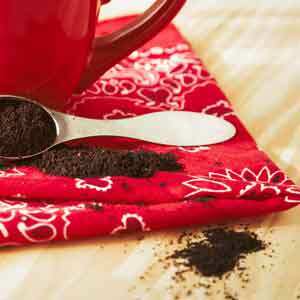 Sometimes, coffee grounds can be mistaken for droppings. A quick and easy way to tell exactly what left their faeces behind is to look at the size and the shape. From a quick glance and to the untrained, they may all seem to be the same, but the fact is they vary in size and shape depending on what left it behind. A careful inspection after learning how to identify them properly will allow you to determine what is responsible. Is approximately a quarter inch long (6.35mm). Tapered on the ends, resembling a long grain of rice. The pellets can be dark or light brown in colour depending on their age. The two most common kinds of rats found in homes are Roof rats and Norway rats. Rat droppings are generally bigger than mouse droppings. The ends are pointed; similar to the mice droppings. Norway rats have even larger pellets. Their droppings are more rectangular in shape. The ends tend to be more rounded; similar to a raisin in appearance. Distribution and quantity is not as accurate compared to the size and shape, but it can help if you’re not entirely sure based on observations from just the size and shape. They’re usually found around breeding and nesting areas, as well as along the pathways where they tend to run. Each mouse can generate an average of about 50 to 75 pellets per day. These are also used to mark out their territory and serve as a kind of signal to other mice in the vicinity. Rat poop can be found in small clusters (Norway rats) or scattered (Roof rats). Both these species of rats can produce up to 50 pellets each per day. The best way to tell what you are actually dealing with is the catch them. If you can catch them (dead or alive) then there is no mistaking what you’re dealing with. Use a combination of adhesive traps (I recommend the bulk glue boards by Catchmaster) and snap traps (I’ve found Victor’s snap traps to be really sensitive and effective). How long has the poop been there? If the droppings are very dark and appear somewhat wet and soft, then you can know that they are still fresh, probably less than twenty-four hours old. After about three days they become dryer and harder, taking on a lighter brown shade. If they are grey and crumbly then they are very old. Do you still have mice in the house or have they left? Perhaps the dropping you have found look quite old and you are wondering if there are still any mice around. The best way to make sure would be to clear away the droppings (using the safety tips for cleaning as described below). Then watch carefully and see if any new droppings appear within the next few days. If so, you will know that you still have a mice infestation to deal with. What is the possible size of the infestation? Given the rate of defecation per mouse which is approximately seventy-five pellets each per day, you could make a rough estimate as to the number of pellets you are seeing in your home. This would give you some idea as to the size of the mouse population living under your roof. The number of mice you catch on your first few nights of using traps will also help you determine the severity of your infestation. Assuming you follow my advice and went all out, you can guess that you’re dealing with a severe problem if you caught 10 mice the first night compared to 1. If you haven’t started using traps yet, get some Catchmaster glue boards and some traps by Victor. Is mouse poop dangerous? Yes, they are indeed dangerous; they can pose a potentially serious health threat. In fact, there are more than thirty kinds of diseases and illnesses which can be spread through infected mouse droppings as well as their urine and saliva. These include bacteria and airborne viruses which can be inhaled especially if the droppings are disturbed through vacuuming or sweeping. Droppings can also affect pets and children. If the pellets are accidentally ingested or come into contact with food items, a doctor should be consulted urgently. Get suitably attired: Make sure you are wearing thick, non-absorbent rubber gloves and a respirator or face mask before handling the faeces. It is advisable that the gloves and any clothing worn during the cleaning operation should be disposed of immediately afterwards. Open all doors and windows: Before starting to clean up, thoroughly ventilate the area by opening all the doors and windows for at least half an hour. This will help to get rid of the smell and disperse some of the harmful particles which may be lingering in the air. Spray down the infected area: Make a disinfectant mixture of one-part bleach and ten parts water. Then use a spray bottle to douse the mouse poop and any surfaces that have come into contact with the mice and their droppings, including any nesting areas. Let it soak for about five minutes. Clean up with paper towels: Now you can get stuck in with the paper towels and wipe up all the mess, wearing your gloves and mask of course. Dispose of all contaminated materials: Place the dirty paper towels along with any other mess into plastic bags and tie it up securely, preferably in a double bag, before placing in an outdoor garbage bin or a landfill. Depending on the severity of the infestation, you may want to bury or burn the contaminated materials. Disinfect the surrounding areas: Once you are rid of them, clean and disinfect your floors and counter tops. Any upholstered furniture or carpets which have been exposed to mice would need to be steam cleaned or shampooed. Wash your bedding with hot water and detergent, and don’t forget to wash your hands thoroughly with soap and water once you are done. Now that you know the facts about mice droppings, there’s no need to be mystified by the sight of those little brown droppings. Knowing the answer to, “what does mouse poop look like?”, you now know what kind of culprit you are dealing with. Knowing what you’re dealing with, you can take the necessary action to restore a clean, peaceful and pest free atmosphere in your home. You can choose to get rid of them yourself, or call in some professional backups.